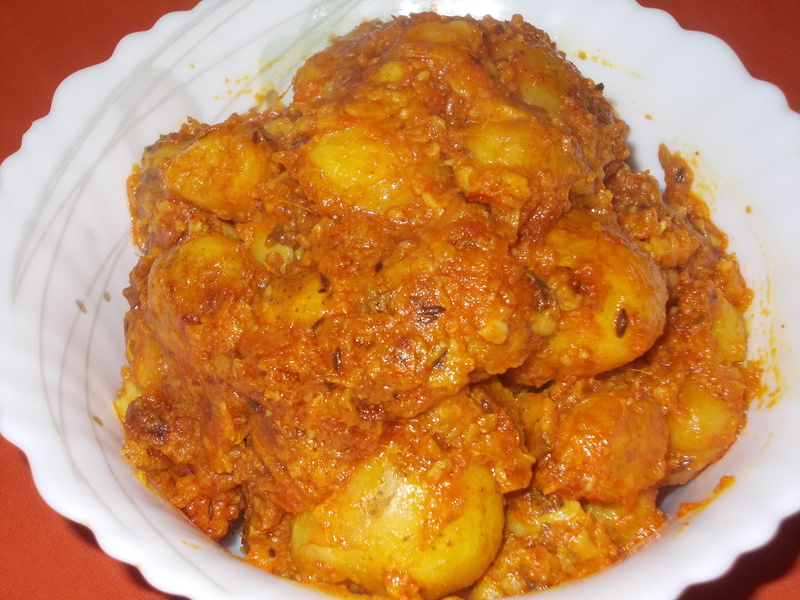 Kashmiri Dum Aloo has its origin in North India. It is a dainty to all vegetarians & served with equally loved naan or roomali roti. Heat oil in a wok. Add asafoetida, bay leaves, whole aniseed. Allow it to change its colour & add cardamom, clove & stir. Add baby potatoes & stir. Add garlic, salt, sugar, turmeric powder, kashmiri red chilli powder & dry ginger. Stir & cook for 2 minutes. Add curd & ½ cup of water. Stir well till potatoes become soft. Add aniseed powder, dry pudina leaves & stir for a minute. Remove from heat & serve hot.